It’s been overcast and a lot cooler out today, high of 71! Went to the store early and picked up a couple of things for dinner and ran an errand for Mom, back home. Got the cart out for a while this afternoon, hadn’t had it out in a while Dad came home yesterday from rehab and is very glad to be back home. He’s having a bit of trouble adjusting back home. At the rehab he was used of pressing a button and having a nurse do everything for him, it’s not going to happen here. He’s very capable to get up do things for himself, plus doing it for himself gets him up and moving, Rehab told us to make him do things and quit sitting around all the time. He’ll be fine though. 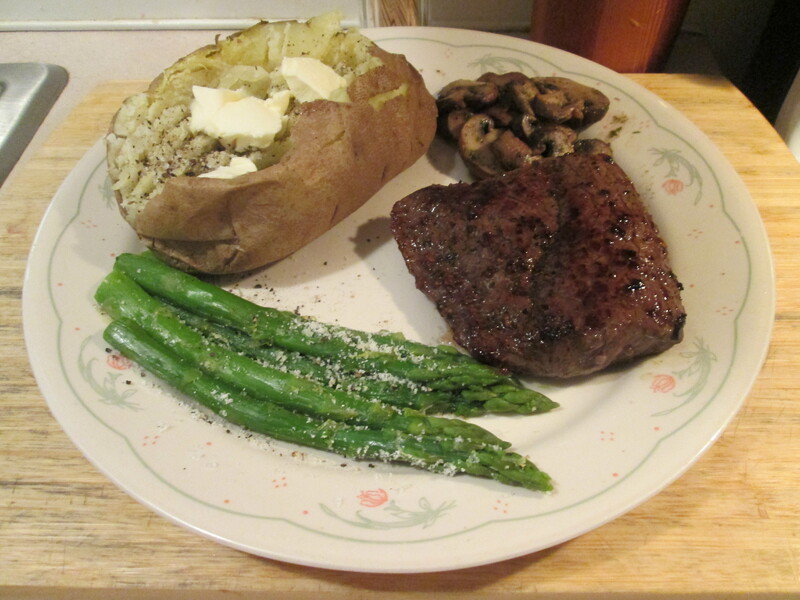 For my dinner tonight I prepared a Bison Sirloin Steak w/ Sauteed Mushrooms, Roasted Asparagus, and Baked Potato. I used a Great Range Bison Sirloin. Great Range is a very good Bison Meat. It’s sold here locally at Kroger. I seasoned it with McCormick Grinder Sea salt and Black Peppercorn and pan fried it in Canola Oil, about 4 minutes per side. Medium rare with a nice char on the outside and a little pink and moist and tender inside, love Bison or Buffalo! For one side I prepared some Sauteed Mushrooms, seasoned with Roasted Cumin, Sea Salt, and Parsley. I also had a Baked Potato and Roasted Asparagus. Then I also had a Baked Potato along with some Kroger Private Selection Handpicked Asparagus Spears. Another microwave side, microwave on high for 5 minutes and they’re ready! Very good side, good to have at hand in the freezer. Comes in a steamable microwave bag, seasoned it with Sea Salt, Pepper, and Kraft Reduced Fat Grated Parm Cheese. For dessert later a Healthy Choice Dark Fudge Swirl Greek Frozen Yogurt. Great Range Brand Bison is produced and distributed by Rocky Mountain Natural Meats. Rocky Mountain Natural Meats started in 1986 as a small meat distributor devoted solely to bison. From the beginning, our focus was to provide high quality bison meat and great service to grocers, distributors and restaurants nationwide. A little hotter and more humid outside, ugh! Went this morning and picked my car up, $178.00. But it beats a new car payment, still runs good at 145,00 miles. My Dad is doing better, they have up out of the wheelchair and walking with the use of a walker. Hope the improvement continues and he can make it home. September 4th is his Birthday, he’ll be 93! Mom ate dinner with Dad at the rehab center so I cooked for one tonight. 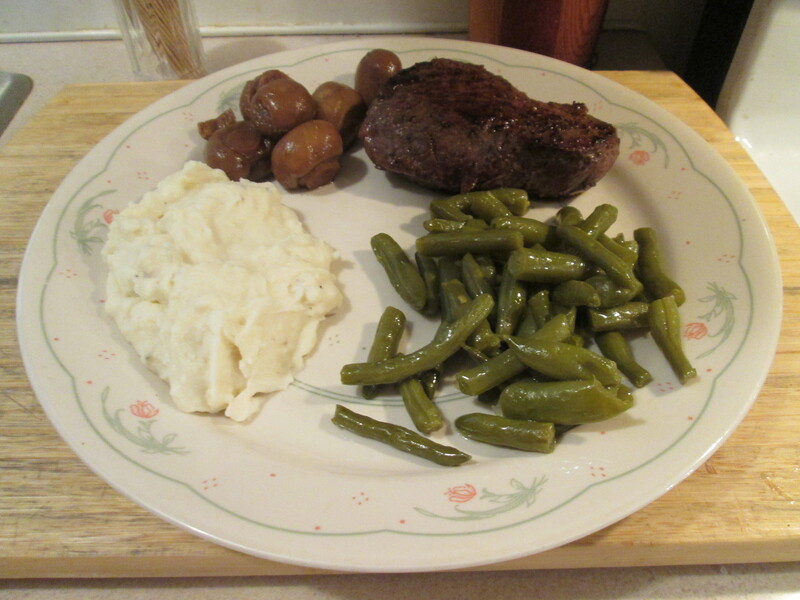 I prepared a Bison Sirloin & Sauteed Mushrooms w/ Mashed Potatoes and Cut Green Beans. 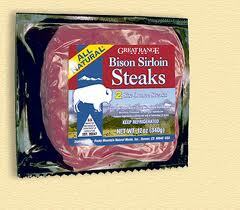 I used a Great Range Bison Sirloin, sold here locally at Kroger. I seasoned it with McCormick Grinder Sea salt and Black Peppercorn and pan fried it in Canola Oil, about 4 minutes per side to a beautiful medium rare with a nice char on the outside and a little pink and moist and tender inside, love that Bison! Served with a side of Sauteed Whole Mushrooms. For another side dish I prepared my favorite Mashed Potatoes, Bob Evans Mashed Potatoes. Easy to fix and delicious. To prepare it just heat it up in the microwave for 6 minutes and it’s ready. Then I also heated up a small can of Del Monte Cut Green Beans. For dessert later a Healthy Choice Vanilla Bean Frozen Greek Yogurt. An in-house grading system was developed to guarantee premium quality and consistency to the end-user – this became the Great Range Bison brand. Carcass characteristics such as fat color, fat cover, muscle color, ossification and weight are the major factors in determining if the product receives the Great Range Bison brand. By working closely with our producers and assisting them with ration formulation, our quality control begins at the source. Today, Rocky Mountain Natural Meats processes over 400 head of bison per week. Started the day off with a Jennie – O Turkey Bacon, one Egg Sunny Side Up, and a couple of slices of Whole Grain Bread. So the day started off real good! Cloudy and Thunder storms on and off all day. Went to a few stores looking for some new bed items, not a lot of choices that I seen out there. Finally found some at a Meijer. 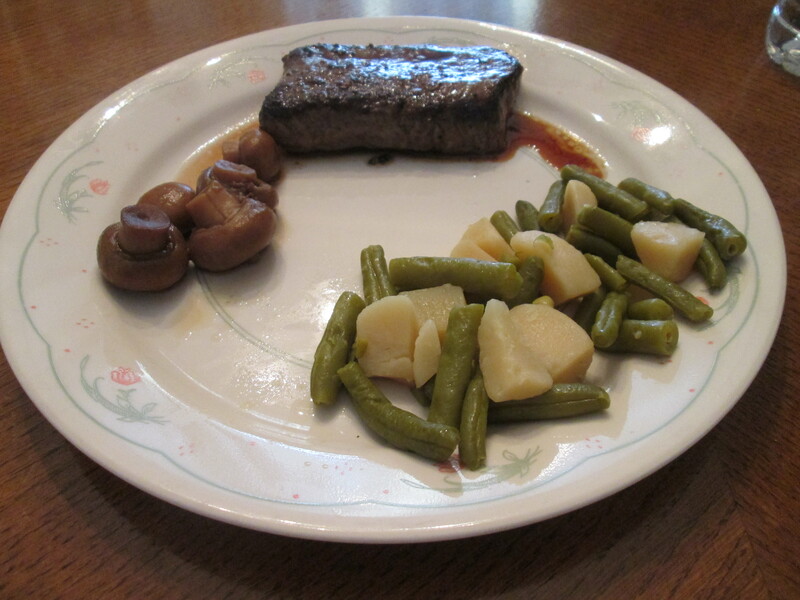 For dinner tonight, Bison Sirloin w/ Cut Green Beans & New Potatoes and Marinated Mushrooms. I used a Great Range Bison Sirloin. It’s sold here locally at Kroger. They’re not quite the sweet and wild flavor as Wild Idea Buffalo but still an excellent Bison Sirloin, and Ground Bison Sirloin also. I seasoned it with McCormick Grinder Sea salt and Black Peppercorn and pan fried it in Canola Oil, about 4 minutes per side. Medium rare with a nice char on the outside and a little pink and moist and tender inside, love that Bison! For one side I heated up a can of Del Monte Cut Green Beans & New Potatoes, a great pairing of my two favorite Vegetables. Then I also had some Teriyaki Marinated Mushrooms. I love these, I buy them from our local Kroger Deli Olive Bar. The Teriyaki just packs the Mushrooms with flavor! I also had a couple of slices of Healthy Life Whole Grain Bread. For dessert/snack later some Ritz Whole Grain Crackers topped with President’s Spreadable Sharp Cheddar Cheese.
. An in-house grading system was developed to guarantee premium quality and consistency to the end-user – this became the Great Range Bison brand. Carcass characteristics such as fat color, fat cover, muscle color, ossification and weight are the major factors in determining if the product receives the Great Range Bison brand. By working closely with our producers and assisting them with ration formulation, our quality control begins at the source. Today, Rocky Mountain Natural Meats processes over 400 head of bison per week.